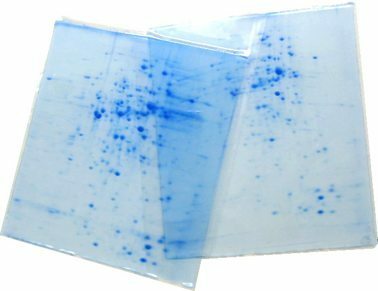 2D Gels stained with commassie blue. Two-dimensional gel electrophoresis, abbreviated as 2-DE or 2-D electrophoresis, is a form of gel electrophoresis commonly used to analyze proteins. Mixtures of proteins are separated by two properties in two dimensions on 2D gels. 2-D electrophoresis begins with 1-D electrophoresis but then separates the molecules by a second property in a direction 90 degrees from the first. In 1-D electrophoresis, proteins (or other molecules) are separated in one dimension, so that all the proteins/molecules will lie along a lane but be separated from each other by a property (e.g. isoelectric point). The result is that the molecules are spread out across a 2-D gel. Because it is unlikely that two molecules will be similar in two distinct properties, molecules are more effectively separated in 2-D electrophoresis than in 1-D electrophoresis. The two dimensions that proteins are separated into using this technique can be isoelectric point, protein complex mass in the native state, and protein mass. To separate the proteins by isoelectric point is called isoelectric focusing (IEF). Thereby, a gradient of pH is applied to a gel and an electric potential is applied across the gel, making one end more positive than the other. At all pHs other than their isoelectric point, proteins will be charged. If they are positively charged, they will be pulled towards the more negative end of the gel and if they are negatively charged they will be pulled to the more positive end of the gel. The proteins applied in the first dimension will move along the gel and will accumulate at their isoelectric point; that is, the point at which the overall charge on the protein is 0 (a neutral charge). For the analysis of the functioning of proteins in a cell, the knowledge of their cooperation is essential. Most often proteins act together in complexes to be fully functional. The analysis of this sub organelle organisation of the cell requires techniques conserving the native state of the protein complexes. In native polyacrylamide gel electrophoresis (native PAGE), proteins remain in their native state and are separated in the electric field following their mass and the mass of their complexes respectively. To obtain a separation by size and not by net charge, as in IEF, an additional charge is transferred to the proteins by the use of coomassie or lithium dodecyl sulfate (LDS). After completion of the first dimension the complexes are destroyed by applying the denaturing SDS-PAGE in the second dimension, where the proteins of which the complexes are composed of are separated by their mass. Before separating the proteins by mass, they are treated with sodium dodecyl sulfate (SDS) along with other reagents (SDS-PAGE in 1-D). This denatures the proteins (that is, it unfolds them into long, straight molecules) and binds a number of SDS molecules roughly proportional to the protein’s length. Because a protein’s length (when unfolded) is roughly proportional to its mass, this is equivalent to saying that it attaches a number of SDS molecules roughly proportional to the protein’s mass. Since the SDS molecules are negatively charged, the result of this is that all of the proteins will have approximately the same mass-to-charge ratio as each other. In addition, proteins will not migrate when they have no charge (a result of the isoelectric focusing step) therefore the coating of the protein in SDS (negatively charged) allows migration of the proteins in the second dimension (NB SDS is not compatible for use in the first dimension as it is charged and a nonionic or zwitterionic detergent needs to be used). In the second dimension, an electric potential is again applied, but at a 90 degree angle from the first field. The proteins will be attracted to the more positive side of the gel proportionally to their mass-to-charge ratio. As previously explained, this ratio will be nearly the same for all proteins. The proteins’ progress will be slowed by frictional forces. The gel therefore acts like a molecular sieve when the current is applied, separating the proteins on the basis of their molecular weight with larger proteins being retained higher in the gel and smaller proteins being able to pass through the sieve and reach lower regions of the gel. The result of this is a gel with proteins spread out on its surface. These proteins can then be detected by a variety of means, but the most commonly used stains are silver and coomassie staining. In this case, a silver colloid is applied to the gel. The silver binds to cysteine groups within the protein. The silver is darkened by exposure to ultra-violet light. The darkness of the silver can be related to the amount of silver and therefore the amount of protein at a given location on the gel. This measurement can only give approximate amounts, but is adequate for most purposes. Molecules other than proteins can be separated by 2D electrophoresis. In supercoiling assays, coiled DNA is separated in the first dimension and denatured by a DNA intercalator (such as ethidium bromide or the less carcinogenic chloroquine) in the second. This is comparable to the combination of native PAGE /SDS-PAGE in protein separation. In summary 2D provides resolution according to two traits, whereof one is most often molecular charge. The investigated molecule needs not be protein. 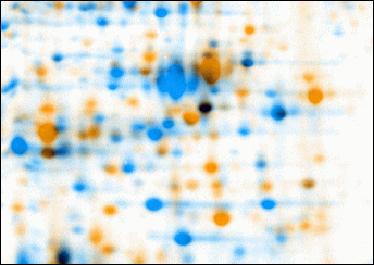 In quantitative proteomics, these tools primarily analyze bio-markers by quantifying individual proteins, and showing the separation between one or more protein “spots” on a scanned image of a 2-DE gel. Additionally, these tools match spots between gels of similar samples to show, for example, proteomic differences between early and advanced stages of an illness. Software packages include Delta2D, ImageMaster, Melanie, PDQuest, Progenesis and REDFIN – among others. While this technology is widely utilized, the intelligence has not been perfected. For example, while PDQuest and Progenesis tend to agree on the quantification and analysis of well-defined well-separated protein spots, they deliver different results and analysis tendencies with less-defined less-separated spots. Generated picking lists can be used for the automated in-gel digestion of protein spots, and subsequent identification of the proteins by mass spectrometry. For an overview of the current approach for software analysis of 2DE gel images see  or . JVirGel Create virtual 2-D Gels from sequence data. Gel IQ A freely downloadable software tool for assessing the quality of 2D gel image analysis data. Arora PS, Yamagiwa H, Srivastava A, Bolander ME, Sarkar G (2005). “Comparative evaluation of two two-dimensional gel electrophoresis image analysis software applications using synovial fluids from patients with joint disease”. J Orthop Sci 10 (2): 160–6. doi:10.1007/s00776-004-0878-0. PMID 15815863. http://www.springerlink.com/openurl.asp?genre=article&doi=10.1007/s00776-004-0878-0. Pedreschi R, Hertog ML, Carpentier SC, et al (April 2008). “Treatment of missing values for multivariate statistical analysis of gel-based proteomics data”. Proteomics 8 (7): 1371–83. doi:10.1002/pmic.200700975. PMID 18383008. Berth M, Moser FM, Kolbe M, Bernhardt J (October 2007). 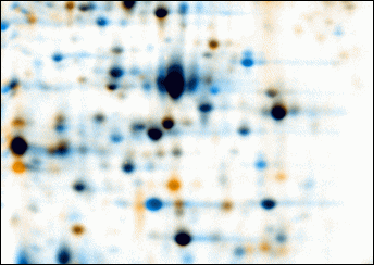 “The state of the art in the analysis of two-dimensional gel electrophoresis images”. Appl. Microbiol. Biotechnol. 76 (6): 1223–43. doi:10.1007/s00253-007-1128-0. PMID 17713763. Bandow JE, Baker JD, Berth M, et al (August 2008). “Improved image analysis workflow for 2-D gels enables large-scale 2-D gel-based proteomics studies–COPD biomarker discovery study”. Proteomics 8 (15): 3030–41. doi:10.1002/pmic.200701184. PMID 18618493. http://www3.interscience.wiley.com/journal/120749796.